My sister and her fiance were visiting from Portland. She teaches science and shared that she had recently been reading an article on why homegrown Heirloom tomatoes taste so much better than commercially produced, genetically modified and supermarket sold “tomatoes.” According to the article in Scientific American, “a tomato’s flavor depends not only on the balance of sugars and acids within the fruit, but also on subtle aromatic compounds.” These compounds are called “volatiles”, are largely lacking in supermarket tomatoes, and the rarest of which make for the tastiest of tomatoes. –We always knew we were on to something, right? In a sauce this simple, the freshness and quality of the ingredients really shine. 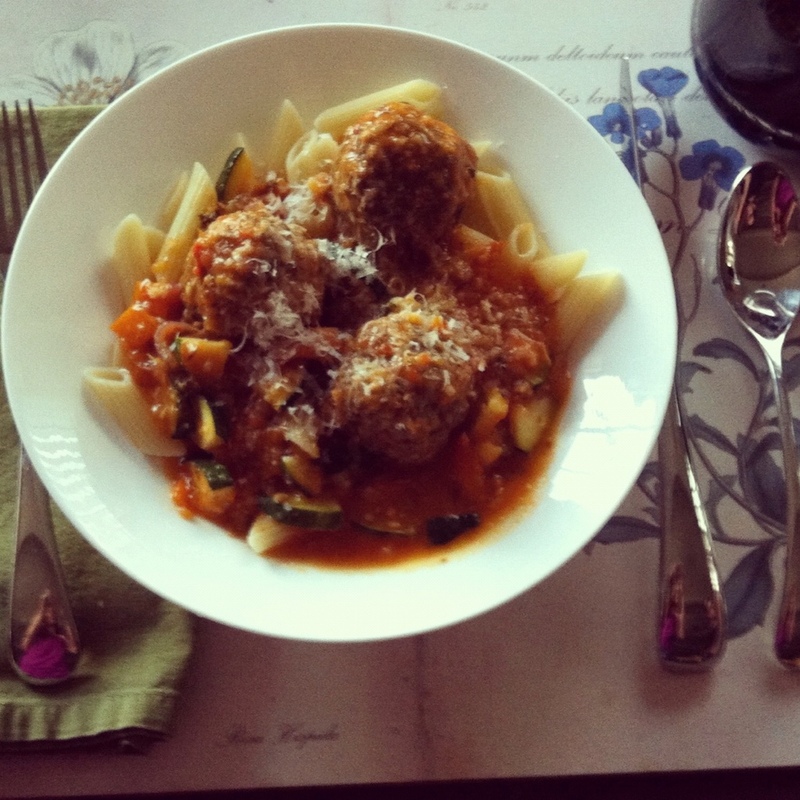 We served it with our favorite meatball recipe, hearty penne pasta and freshly grated parmesan. 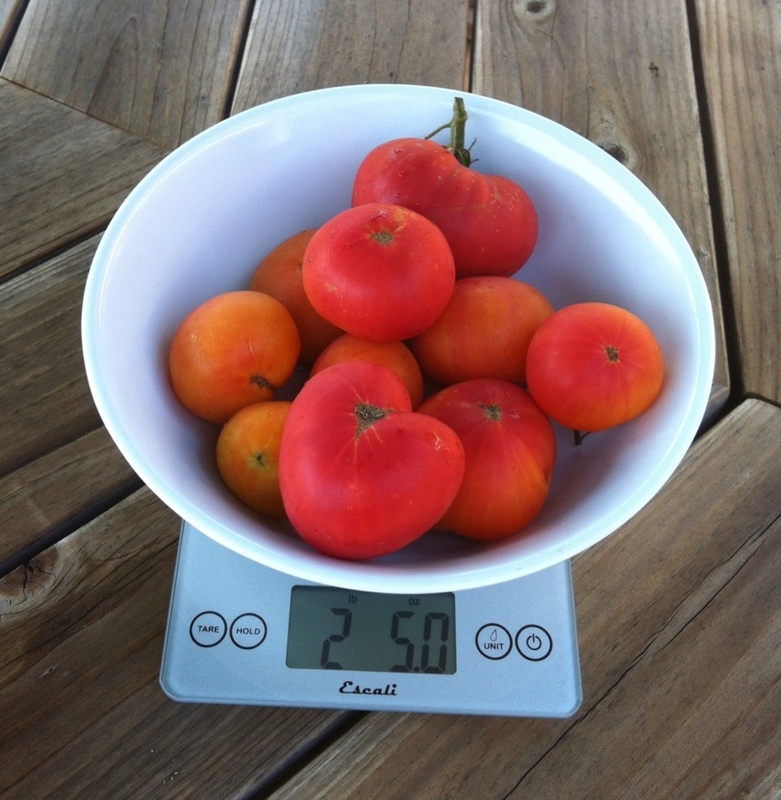 Cut or obtain 2 pounds of tomatoes. 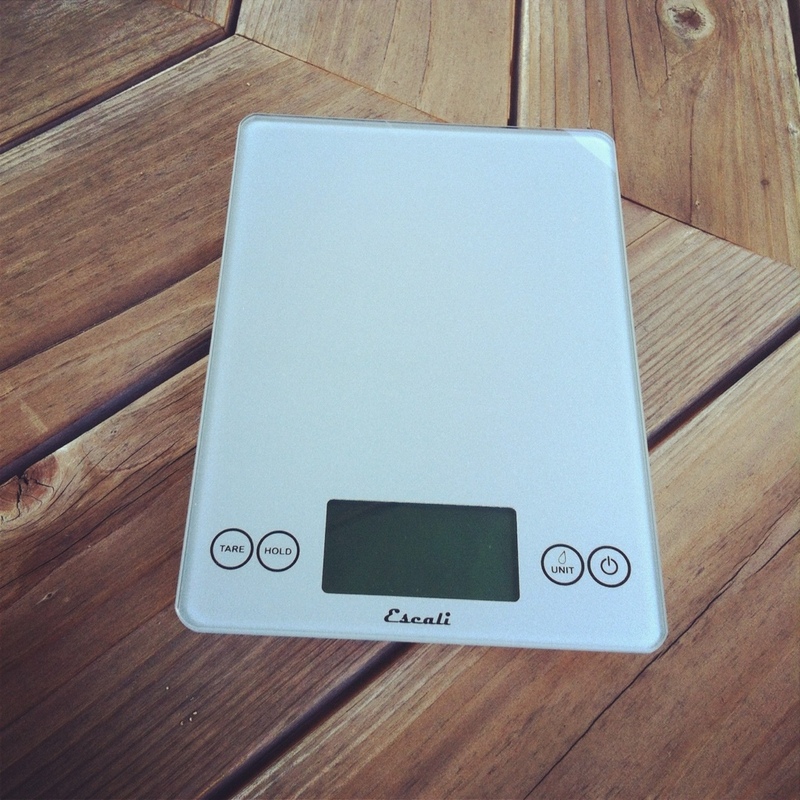 I had been wanting to try out our new kitchen scale . It’s cute, huh? It is the size of an iPad and also comes in fun colors, like purple. 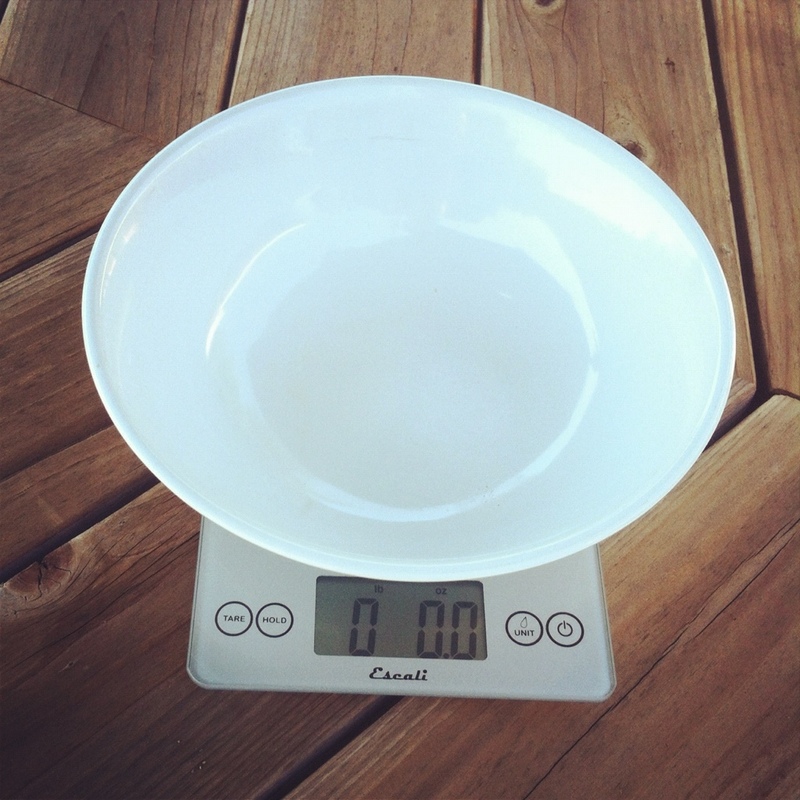 It has a hold function, but it was quick and easy to put another (identical) empty bowl on the scale and zero it out. Although the recipe calls for 2 pounds, I happened to have 2 pounds and 5 ounces and just rolled with it. 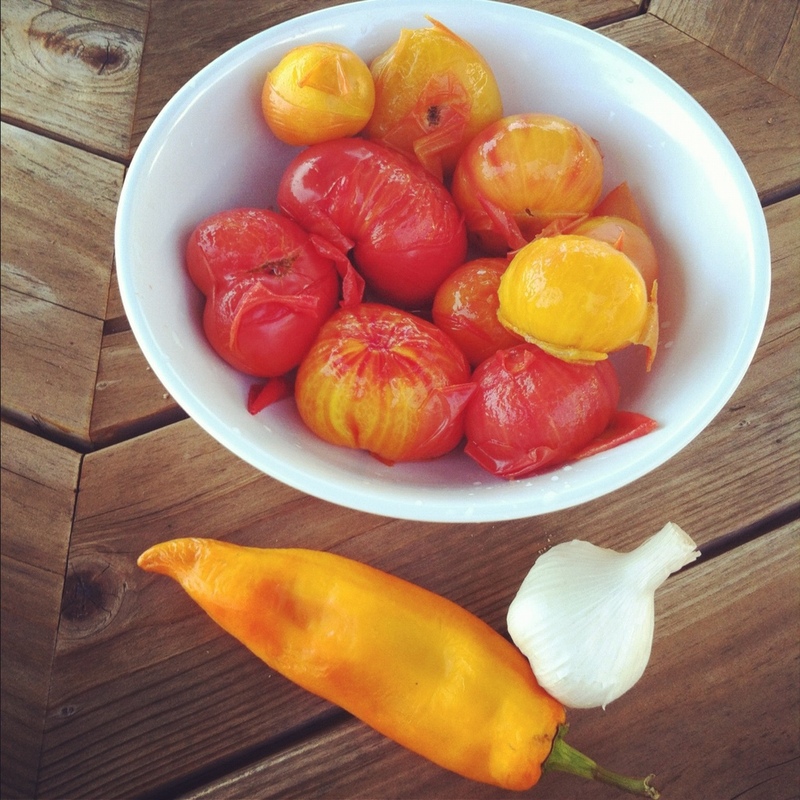 I washed and scored the tomatoes. 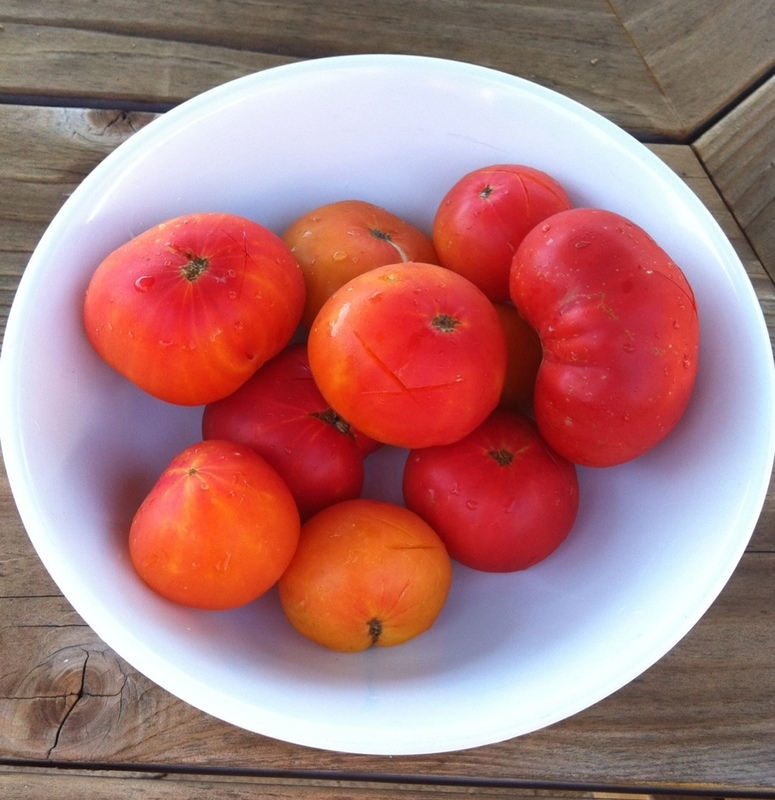 Please see this post for step by step directions on how to easily peel tomatoes. Peel, seed and dice 2lbs of ripe tomatoes. Save the juice, strain out the seeds, and add the juice to the diced tomatoes. Peel 5 large garlic cloves. Smash them and chop coarse. Put a heavy-bottomed pot over medium heat and when hot, pour in 1/4 c. extra-virgin olive oil. Add the garlic and when it starts to sizzle, immediately add the tomatoes and their juice with a large pinch of salt. Cook at a simmer for 15 minutes. For a smooth sauce, pass through a food mill. Variations: Add a handful of chopped parsley, marjoram, or oregano or a chiffonade of basil leaves to the sauce a couple of minutes before it is done. Saute 1 small diced onion in the oil before adding garlic. Add a whole dried chile or a pinch of dried chile flakes for spice. I used just the tomatoes, garlic and basil. I was going to use the pepper from our garden but I really wanted to test out the basic sauce. It’s surprisingly flavorful! I did end up sautéing the pepper with zucchini and onions from the garden. We served the veggies, sauce and fresh parmesan over hearty penne with meatballs made by Papa Bird. This entry was posted in Healthy Recipes, Preserving and Canning, Recipes for the Whole Family, Recipes from the Garden, Step by Step with Pictures, Urban Agriculture, Urban Homesteading and tagged easy farm to table, easy seasonal recipes, farm to table, heirloom tomatoes, homesteading, meals for the whole family, preserving, Urban Homesteading, victory gardens. Bookmark the permalink. Aw, this was an extremely good post. Finding the time and actual effort to create a superb article… but what can I say… I hesitate a whole lot and never seem to get anything done.